If you’re a Christian, that’s your real job, to be SALT. Coach spoke in Manchester, Iowa at a high school event, recently. 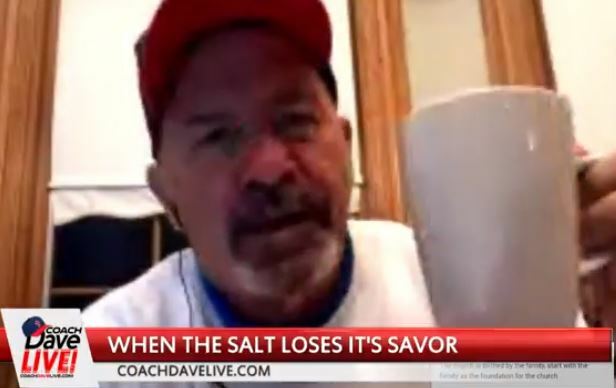 He talked about salt. Why salt? Why didn’t Jesus say you are the garlic of the earth? Molasses? Pepper? Hot sauce? Cotton candy? Sugar? Why did He say salt? Salt makes the steak taste salty. If we’re the salt, it should make others thirsty. Before they had refrigerators, they preserved meat. Salt the meat. It preserves the meat, keeps it from rotting. What else does salt do? Someone else says, “Salt heals.” Your mom says to go gargle with salt to heal your sore throat. Salt kills slugs. Sometimes you have to pour salt on the slugs. Maybe salt melts a cold heart. Now we know why Jesus didn’t say we were garlic. But if the salt loses its saltiness, we are useless.